We are so very happy. We have a wood chipper. 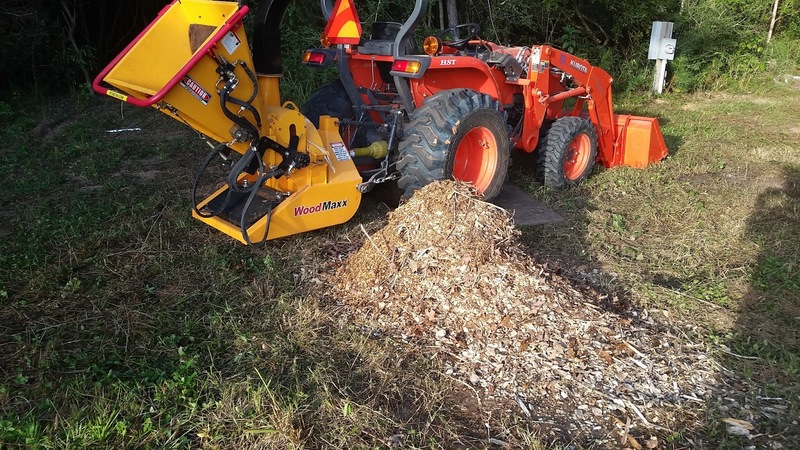 I purchased a used WoodMaxx TM-86H from Craigslist.org. 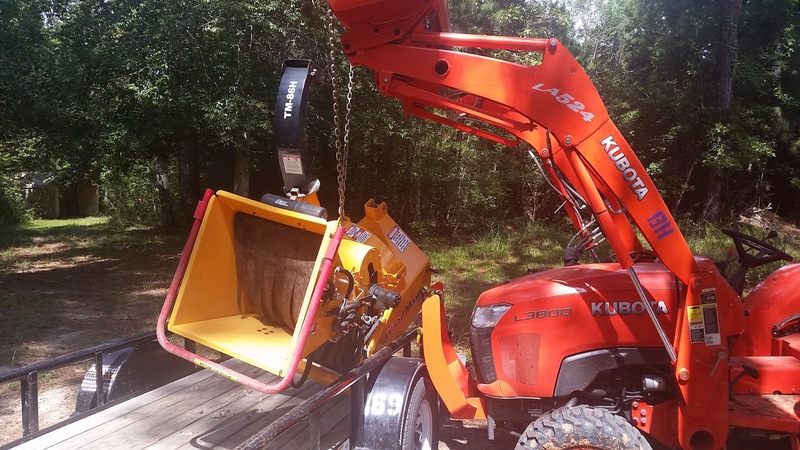 It was a really smooth transaction, I saved a lot of money over buying new and I got the wood chipper right away! Craigslist.org rules. Now we don't have to burn the brush that we remove from the forest. I didn't like the risk of burning a large brush pile and I didn't like the loss of compost material for the forest. Now, we will chip up the brush instead of burning. 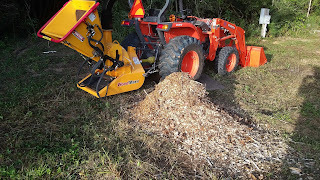 We'll use some of the wood chips around our buildings, some we'll use for compost and the rest will be spread out in the forest to decompose. It's much better than burning. 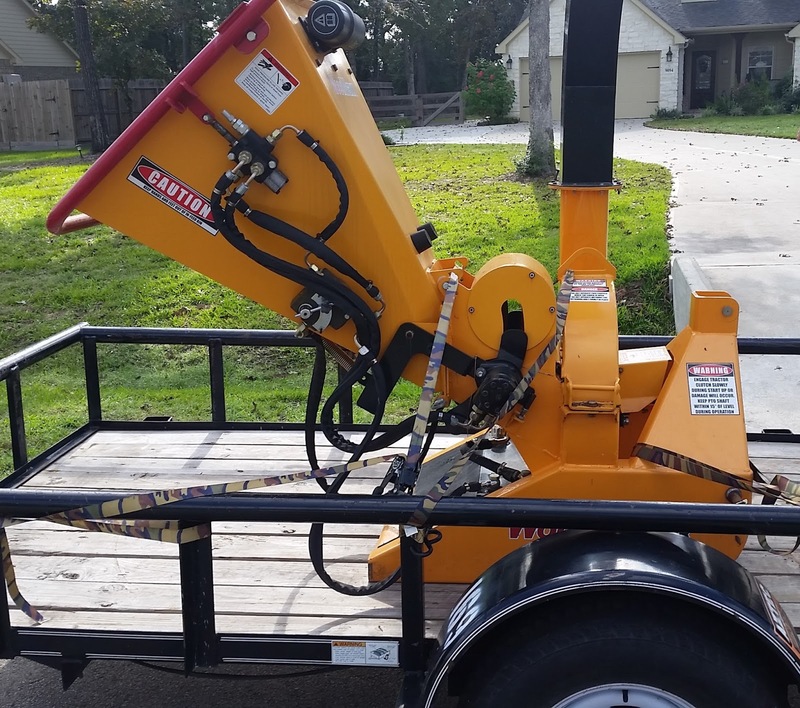 I had to rent a trailer from Aztec Rental Centers to move the wood chipper from Conroe, TX to our place just north of Woodville, TX. The trailer I normally use was in the shop being repaired. As you can see from the picture, if I'd have shortened the chain, I might have been able to lift the wood chipper all of the way off of the trailer. Instead I raised it and then drove the trailer out from under the chipper. I had a small pile of brush that had been sitting for a couple of months that I tried the chipper out with. It worked pretty well. I'd have to help out occasionally, but the wood chipper pretty much pulled in everything I fed it. It should work better once I reverse the cutting blades. The original owner never reversed or sharpened the blades. Before I can reverse the blades I need to purchase some tools. I intend to create a small tool box with just the tools I need for the wood chipper. It will be nice to just grab that box instead of searching through my tool box.